If your morning is a blend of chaos and too many snooze’s, then these Sweet Potato Hash Egg Cups are for you. Three ingredients + seasonings – couldn’t be easier, healthier or more delicious. 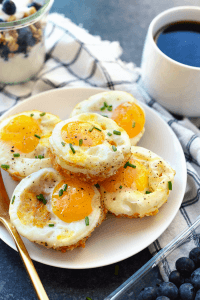 Developed by Fit Foodie Finds, these epic egg cups are perfect for mornings on-the-go – coffee mug in one hand, egg cup the other. For the step-by-step video tutorial, visit Fit Foodie Finds for the full recipe!